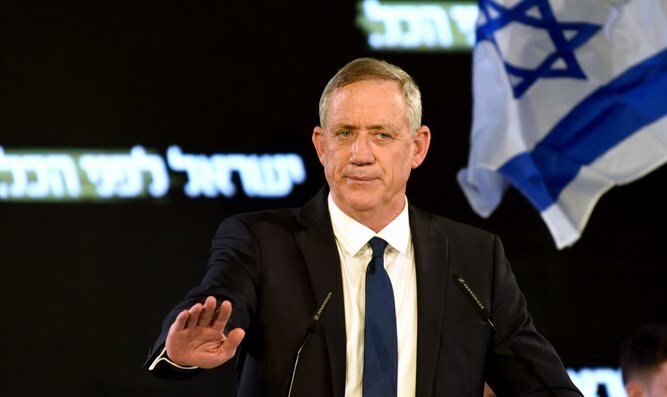 Hosen LeYisrael party livid after Netanyahu posts quote attributed to Gantz and his willingness to sit in a government with the Arabs. Hosen LeYisrael chairman Benny Gantz on Friday accused Prime Minister Binyamin Netanyahu of spreading lies, after Netanyahu posted to his Facebook page a screenshot from the Srugim website with a quote from Gantz saying in an interview he "does not rule out sitting in a government with the Arabs." The Srugim website later changed the headline of its item on Gantz. The Hosen LeYisrael party on Friday night demanded that Netanyahu remove the post from his social media accounts. "It would be fitting that on this difficult day, the prime minister will deal with running the state and the protection of its citizens instead of spreading lies on Twitter, Instagram and Facebook. Elections will also be held here with respect and truth," said Gantz’s party, demanding that the "false" posts be removed immediately.